We have developed the "Econo-Pilot" energy-saving system for water pumps, which reduces the power consumption of motors for water supply. In the energy-saving control field, the conventional method used is that of constant pressure control of the water supply with inverters. However, as Econo-Pilot employs a method of variable water pressure control corresponding to flow volume, the system can raise the energy-saving ratio up to 90 percent. This paper describes the principles of the system and its basic functions, along with a case study of some practical applications. With the background of fulfilling public commitments for the prevention of global warming, many countries have consolidated related laws and regulations aiming to reduce energy consumption. Energy conservation has become one of the important issues for companies and organizations accredited with the ISO 14000 series standards certification because they are required to achieve yearly targets for improvements, which have, in a sense, the same implications as laws. In a prolonged recession, investments in energy-saving activities directly linked with cost reduction have attracted increasing attention. However, large-scale renewal investments which entail enormous costs cannot be implemented easily. Consequently, there have been increasing needs for energy conservation activities which bring about substantial cost reduction effects but can be conducted inexpensively with ease and minimum risks, while at the same time utilizing existing facilities. Figure 1 is a graphical indication of the energy consumption ratios of office buildings, which is based on research conducted by the Building-Energy Manager's Association of Japan. 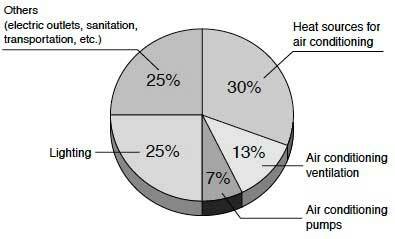 As indicated in the graph, air conditioning-related items account forhalf of the total consumption. This means that air conditioning must be the main target for energy conservation. Among air conditioning-related technologies, we have focused on the control of air conditioning pumps and have developed a new energy-saving control system called "Econo- Pilot" which meets the requirements for implementations mentioned earlier. Figure 2 shows an external view of this system. 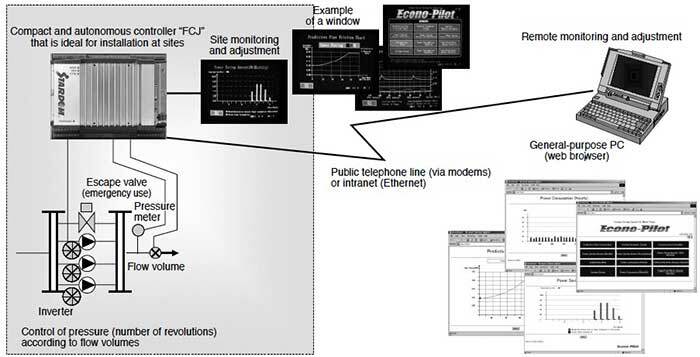 The Econo-Pilot adopts a new control mechanism contrived by three enterprises—Yokogawa Electric Corporation, Asahi Kogyosha Co., Ltd., and The First Energy Service Company, Limited—and was commercialized by Yokogawa after the development and demonstration phases, through joint research with the New Energy and Industrial Technical Development Organization (NEDO). 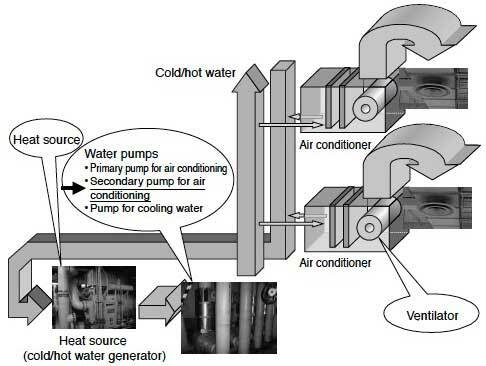 Figure 3 shows an overview of an air conditioning system. Broadly speaking, energy is consumed by heat sources, water pumps, and ventilators. A heat source generates cold/hot water through gas combustion in the case of applying a gas-based cold/hot water generator, the cold/hot water is then conveyed to air conditioners by water pumps. Inside air conditioner, the cold/hot water is flowing through heat exchange equipment where air is warmed up or cooled when passing through the heat exchange equipment via ventilators, and then the warmed/cooled air is blown to an area through ducts. Water pumps are mainly classified into primary pumps, secondary pumps, and cooling pumps, but their power consumption is almost the same. Among them, we have focused on secondary water pumps whose flow volume varies significantly according to demand. 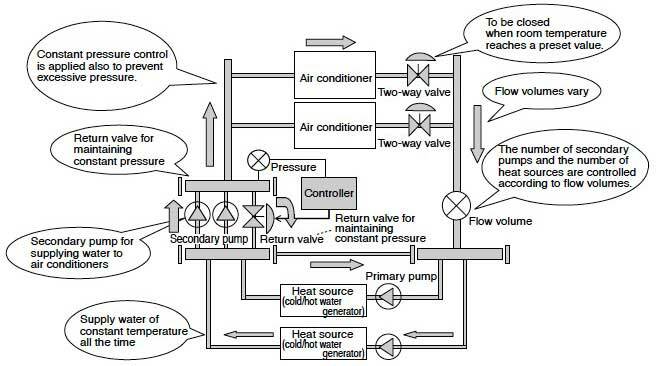 Figure 4 shows the configuration of a typical air conditioning system, which indicates the flow direction of cold/hot water by using arrows. Cold/hot water generated in heat sources is returned by primary pumps so that water at constant temperature is always available. Secondary water pumps are responsible for conveying the cold/hot water upon demand of the air conditioners on the load side. Air conditioners are controlled locally on each floor or in each area by room temperature sensors and two-way valves. These valves are closed automatically when the room temperature reaches a preset value. As a result, the flow volume of cold/hot water running on the secondary pump side varies significantly. In order to support the flow volume fluctuations efficiently, multiple secondary water pumps are frequently used: for example, two or three pumps are operated to control the turning on/off of each pump according to flow volume changes. Moreover, in order to protect the pipes and air conditioners, return valves are used for control so that constant pressure will be applied to the pipes. However, these return valves play another role of bringing the pumped water back to the original locations, which is essentially a waste of power. Recently, with the prices of inverters becoming less and less expensive, an energy-saving technique of increasing or decreasing the number of revolutions of water pumps to supply only the necessary amount of water has become increasingly common. However, since these inverters employ a control mechanism to maintain constant pressure as in the case of return values, they do not, in actuality, bring about substantial energy conservation effects. 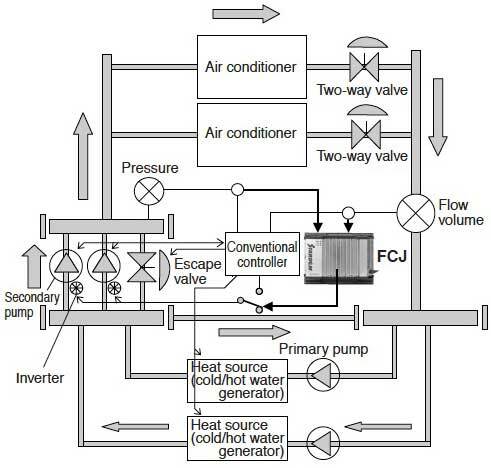 Figure 5 exemplifies the configuration of an air conditioning system based on the Econo-Pilot. The Econo-Pilot can be easily introduced if a compact site-based "STARDOM FCJ" controller is added to an existing air conditioning system. More specifically, sensor signals that have been used in the existing control system are branched out and are connected to the STARDOM FCJ. Outputs for directing the number of revolutions are connected to inverters by way of a switch. Since this configuration enables the existing control system to remain as it used to be, focusing on the energy conservation of water pumps, complicated work such as the readjustment of existing control system is never required. The conventional inverter method employs a constant discharge pressure control mechanism. On the other hand, the Econo-Pilot has achieved energy-saving by optimizing the discharge pressure control while taking account of pressure loss in pipes. Flow volumes are proportional to the number of revolutions. Discharge pressure (pump head) is proportional to the square of the number of revolutions. Power consumption is proportional to the cube of the number of revolutions. That is, if a flow volume is 1/2, pressure becomes 1/4 and power consumption becomes 1/8, thereby providing a power reduction ratio of 87.5 percent. Figure 6 shows the differences between a conventional control mechanism and the Econo-Pilot mechanism. The intersection point between the horizontal line showing the constant pressure and the head curve is the operation point. Since a return valve provides pressure control, the pump's operation point is always the same regardless of load situations, while power consumption also remains the same. At present, this method is the commonly used energy-saving technique for secondary water pumps. Since constant pressure control is adopted, the operation point moves on the linear constant pressure line. The number of revolutions cannot be decreased substantially, because pressure needs to be maintained even if the flow volume is small. Consequently, the power reduction ratio is usually in the degree of 20 to 30 percent. This method is employed for the Econo-Pilot. Since the method allows the operation point to move on the conduit resistance curve, the graph shows that energy-saving effects increase dramatically if the flow volume is small. Figure 7 shows an example of system configurations. The compact "STARDOM FCJ" controller that can be installed at sites provides not only a control function superior to PLC, but also an information processing function equivalent to the one of PCs. 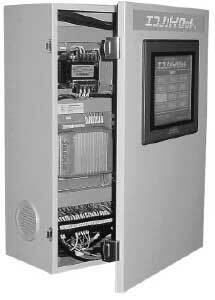 This controller is connected to an indicator for site operation monitoring that is used to monitor energy-saving operations or change settings. The indicator also enables real-time monitoring of power reduction ratios or monthly energy consumption/eduction status. Logging and monitoring of energy-saving effects (i.e., power consumption ratios) further enable users to optimize operational conditions for energy conservation or to check returns on investments. Moreover, the Econo-Pilot allows users to operate and monitor windows showing the same information through web browsers, thereby enabling the energy monitoring and adjustment in anytime and at anywhere. One of the advantages of adopting web browsers is that users can adjust their systems remotely. For example, users can initially carry out rough adjustments at sites. Then, remotely, they can perform gradual adjustments to enhance energy-saving effects while checking the operational conditions. If any changes occur on the load side—for example a dramatic increase in personnel—users can remotely access their sites to obtain detailed information and provide optimized readjustments. Thus, enhanced energy-saving effects can now be obtained without risks. The Econo-Pilot is ideal for energy conservation of factories or ordinary buildings, especially for already installed secondary pump facilities. It can also be applied to water pumps in general which provide not only air conditioning but also pressure control. One of the most effective applications is realized during "long-term operation." The longer operation hours become, the greater energy is saved even for the equipments of the same scale. For example, on a yearly basis facilities such as semiconductor- related factories, hospitals, or hotels operating continuously for 24 hours a day generate reduction effects which are several times greater than those of office buildings. Moreover, if the scale of a facility (i.e., power consumption of pumps) is larger, greater financial gains can be obtained even from the same reduction ratio. This control system has actually been introduced to a university hospital, the details of which are described below. This case shows that greater reduction effects were obtained in comparison with that using a conventional inverter's constant pressure control. This paper focused on a case study in which a secondary water pump for air conditioning used our energy-saving control system, which can be inexpensively installed with ease while utilizing existing facilities. Environmental investments including energy-savings can be implemented only when they are compatible with economic efficiency, from which substantial environmental improvements can be expected. We intend to support cost reductions at offices, factories, and other locations by broadening the scope of this system to equipment other than secondary water pumps for air conditioning, thereby contributing to further reductions of global warming gases. We would like to express our appreciation to all parties involved in the research and development of this product, which was achieved through joint research with the New Energy and Industrial Technology Development Organization (NEDO) under a project entitled "Development of Optimum Control Technologies for Reduction of Operational Electric Losses". "Econo-Pilot" is a trademark of Yokogawa Electric Corporation. The Econo-Pilot received the Agency of Natural Resources and Energy Director-Genera's Award for fiscal year 2002.